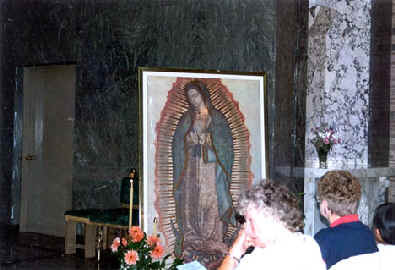 The Missionary Image of Our Lady of Guadalupe visited the chapel of the National Shrine of Our Sorrowful Mother in Portland, Oregon on August 15, 1991. On the front wall of the chapel, there is a large drawing of the Holy Trinity bestowing the Crown on Virgin Mary as the Queen of Heaven and Earth. This crown also means that she received sufficient power to defeat Satan and his devils in the ongoing war. The Holy Eucharist above the Blessed Mother’s hands. The Holy Spirit looking at the Blessed Mother and, at the same time, looking at us. The Blessed Mother said to Fr. Stefano Gobbi on August 15, 1974: “Today is my feast: all Paradise exults and the Most Holy Trinity rejoices at the reflection in me of Its most pure light.” The bright light radiating from Our Lady in the photo must be the reflection of the most pure and holy Light from God. St. John the Apostle said: “God is light.” (1 John 1:15) This light will heal and sanctify our souls and repel the devils. The Blessed Mother kneeling, weeping, and praying for the numerous children who are exposed to the danger of abortion. This image resembles Our Lady of Naju in Korea. The Blessed Mother’s large Immaculate Heart, which is our safe refuge in this end time. The Blessed Mother is not wearing a veil or mantle any more because she is receiving the Crown from the Holy Trinity. An image of Our Lady of Lourdes of 1858 when she confirmed the dogma of her Immaculate Conception proclaimed by Pope Pius IX in 1854. In 1531, when the Blessed Mother gave us the gift of her mirculous Image on St. Juan Diego’s tilma, those who came and looked at the Image did not need any verbal or written explanation for understooding the meanings contained in the images. By looking at and interpreting the many images, they understood that the God Whom the Lady from Heaven was worshiping was the true God infinitely more powerful than the false gods they had been fearing and worship-ping and also most merciful and justful unlike their previous cruel and uncaring gods and that the Lady was not only the Mother of the true God but also their own Mother who was most loving and tender to each and every one of them who trusted and loved her. 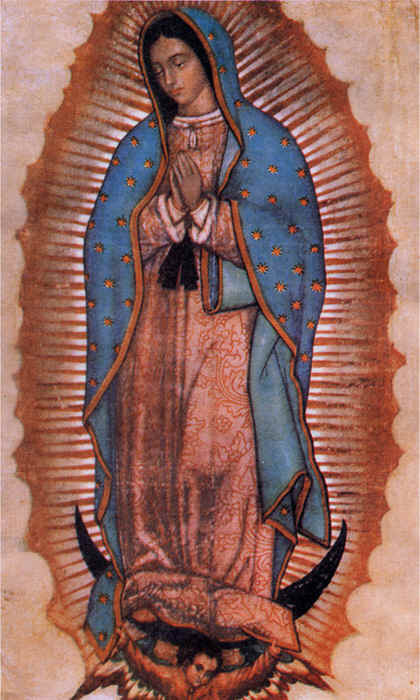 Of course, Our Lady gave some verbal messages to St. Juan Diego before the miracle of the Image on tilma, but did not explain each image on the tilma as she trusted that the people would have no difficulty in understaing her messages through the Image. 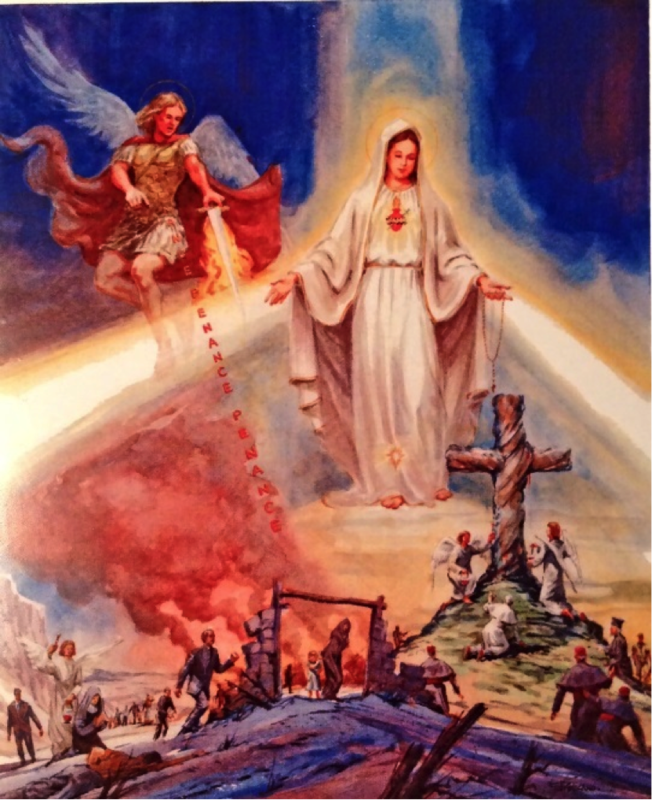 Likewise, the Blessed Mother did not give us any verbal or written explanation of the new images in the photograph. I am sure that, if we humbly focus our minds and hearts on the images, we will easily and clearly understand their true meanings. And, over time, our understanding can become deeper. 2. Keep your souls clean so that the Holy Spirit will always dwell in you and guide you. 3. End abortions and birth controls and protect your chastity. And sanctify your family. 4. Worship and obey God Who is the Light of infinite truth, justice, goodness, love, and life. 5. In this dangerous time, do penance and take refuge in my Immaculate Heart. 6. Spread my image all over the world that more people may become aware of my presence, love and trust me more, be saved, and bring peace to this world.